George P. Smith, recipient of the 2018 Nobel Prize in Chemistry, announced that he has chosen to donate his Nobel Prize money to support students in the College of Arts and Science. COLUMBIA, Mo. – University of Missouri officials announced today that George P. Smith, Curators Distinguished Professor Emeritus of Biological Sciences and recipient of the 2018 Nobel Prize in Chemistry, has chosen to donate his Nobel Prize money to support students in the College of Arts and Science. Smith and his spouse, Professor Emerita Marjorie Sable, made the announcement at the end of a community event that highlighted the Nobel Week experience for Smith, his family and others who travelled to Sweden in December. 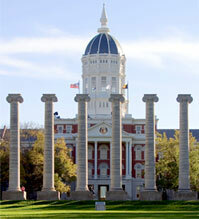 $200,000 from MU and the UM System through the Missouri Compact Promise & Opportunity Scholarship Program. $100,000 that MU Chancellor Alexander N. Cartwright set aside in support of student scholarships. Cartwright announced MU is creating a new tradition where the university will set aside this amount of money for scholarships every time a faculty member wins a Nobel Prize. Anyone who wishes to add to the Missouri Nobel Scholarship Fund can donate during this year’s Mizzou Giving Day, which runs from noon Wednesday, March 13, to noon Thursday, March 14. Gifts to the fund will continue to be matched dollar for dollar under the Promise & Opportunity Scholarship Program. In December, Smith, Cartwright and a small group of student reporters from the Missouri School of Journalism traveled to Stockholm, Sweden, to experience Nobel Week. While in Stockholm, Smith received his prize, explored opportunities given only to Nobel Prize winners and met with Swedish royalty. Meanwhile, Meg Cunningham, senior convergence journalism major, and Savannah Rudicel, senior broadcast journalism major, had the rare opportunity to report on all the pomp and circumstance. During the event Tuesday evening, Smith began with a short lecture on phage display, the evolutionary biology process that won him the prize. The lecture was followed by a panel discussion where Smith, Sable, Cartwright, Okker, Cunningham and Rudicel shared what they experienced in Stockholm. The event concluded with an announcement from Smith that he and Sable had chosen to donate the prize money to MU. The gift reflects their continued support for students who choose to pursue the arts and sciences.